If you’re still bemoaning the fact that the Penguins haven’t scored on the power play in the month of February, or citing that the Penguins have scored on just 13.3% of their power play attempts since November 9th, you’re making too much of their struggles. Yes, zero (0) power play goals in the month of February is a problem. Power play goals are nice. Everyone likes them. They hold the potential to change a game on a dime. Having an elite power play helps you rack up points not only for your stars but for your team as well, and it’s always a good idea to have a secondary mode of scoring when the even strength goals just aren’t coming. But at the same time, isn’t the reverse something we’ve worried about in the past with the Penguins? The Penguins haven’t had any trouble scoring on the power play in the last couple of seasons. From 2011-2014, their power play units have ranked 5th, 2nd, and 1st in the league. They can score with the man advantage, critics have said, but will they be able to score in the playoffs when the power plays aren’t awarded as often and they’re up against the toughest teams? Other people have written about what the Penguins might do to improve their power play (spoiler: shoot more), and while I would like to see the power play get better, I am taking it as a blessing in disguise that the power play is struggling. No, not because the struggle means they have to address the problem now and get the power play firing before the playoffs (though that would be nice), but because you don’t need an elite power play or even a really good power play to succeed in the post season. Here’s a look at how the best teams in the league have stacked up on the power play in recent years alongside the Penguins. I’ve bolded the eventual Stanley Cup winner for each year. *To determine which teams to use for the 2014-2015 season, I listed the top 4 teams the league in score-adjusted Fenwick for percentage, as it is the best metric we have of playoff success (for reference, in order: NYI, CHI, TBL, LAK, STL, PIT). From the chart, it doesn’t take a very good power play to get far in the post season. The last three Stanley Cup winners had the 27th, 19th, and 17th ranked power plays in the league. Oddly, in the last three seasons, no team has even made the Stanley Cup Final with a power play ranked better than 10th in the league, and except for the Penguins, with the 2nd ranked power play in 2012-2013, no team has made their conference final with a power play ranked better than 10th either. Perhaps what we are noting above—that it doesn’t take a very good power play to go far in the playoffs—is because of the oft-cited idea that power plays are called less often in the playoffs because referees are hesitant to allow a power play goal to decide a game. The refs let ‘em play. If it’s because power plays are called less often or for some other reason, it would be wrong to assume I’m implying a causal relationship. 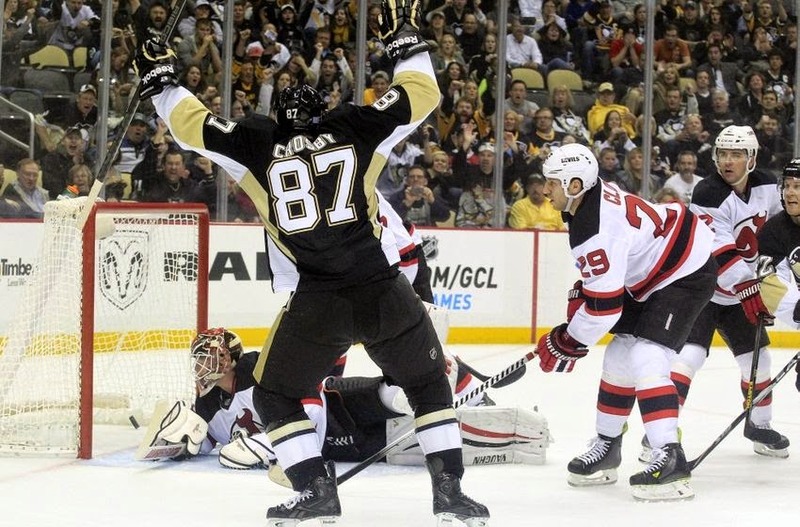 The Penguins should not aim to have an average power play. At the end of the day, the team that scores more goals wins the game, and any advantage possible to score more goals should be exploited. What I think this does reveal, however, is what the Penguins should be focusing on: 5 v 5 scoring and puck possession. What the teams that have succeeded in the post-season have in common with each other is excellent possession. With the exception of the 2011-2012 season (when the Penguins ranked first in the league in scored-adjusted fenwick for percentage and were sunk in the playoffs by goaltending and a fit of team madness), the Penguins have not headed into the playoffs at the same level as the top teams in the league in terms of possession. Some of this is injury based, some of this is because of poor roster depth. But no matter what the reason, the elite scoring the Penguins have gotten out of their power play has allowed them to keep winning in past years and hide both a lack of secondary scoring (impacted by having a bottom 6 that has not been able to possess the puck in recent years) that has sunk them in the playoffs. If the Penguins figure out the power play, great. It’ll help win a few extra regular season games, and with a tough division this year, any help the Penguins can get is a good thing. But if the Penguins don’t figure out the power play, it’s not time to despair. What this does is call attention to the way the Pens have struggled at times to score at even strength—the category that really matters—and hopefully this allows the team to address concerns that have more playoff significance at the trade deadline, rather than hiding them.